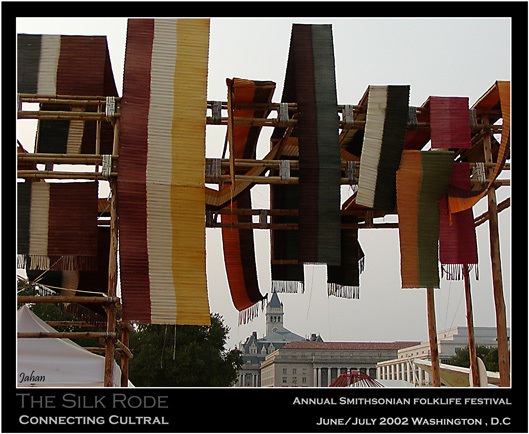 Фото "The silk rode #1"
The Silk Road: Connecting Cultures, Creating Trust celebrates the living traditional arts of peoples of Silk Road lands which it has been holding in Washigton DC. I will be happy to post future event`s photographs about this multicultral project. To get more info check out the main page ( in FLASH ) includs different other pages in itslfe!!! very interesting picture and point of view, Jahan!! It must be also a very interesting cultural event. And i want to see some more! Excellent composition! Very nice shot ! Beautiful work, Jahan! I congratulate! Excellent graphism of the colors, very well Jahan ! Excellent composition with nice colors, Jahan! Excellent composition. I like it!